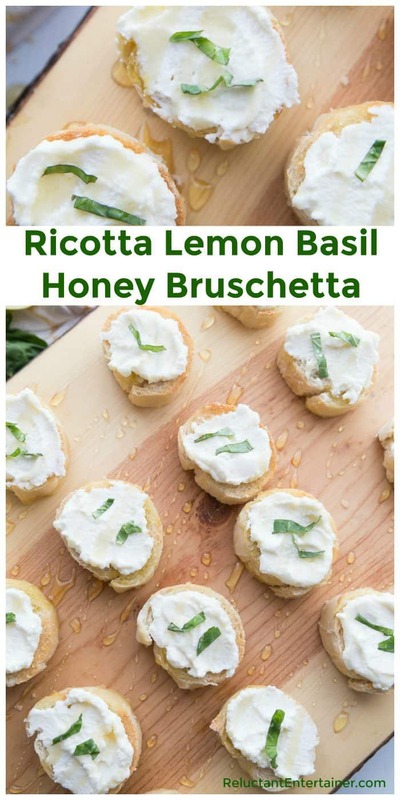 Fresh and light, this Ricotta Lemon Basil Honey Bruschetta is a delicious, tasty appetizer with bright flavors of lemon, honey, and fresh basil. WATCH THE VIDEO! 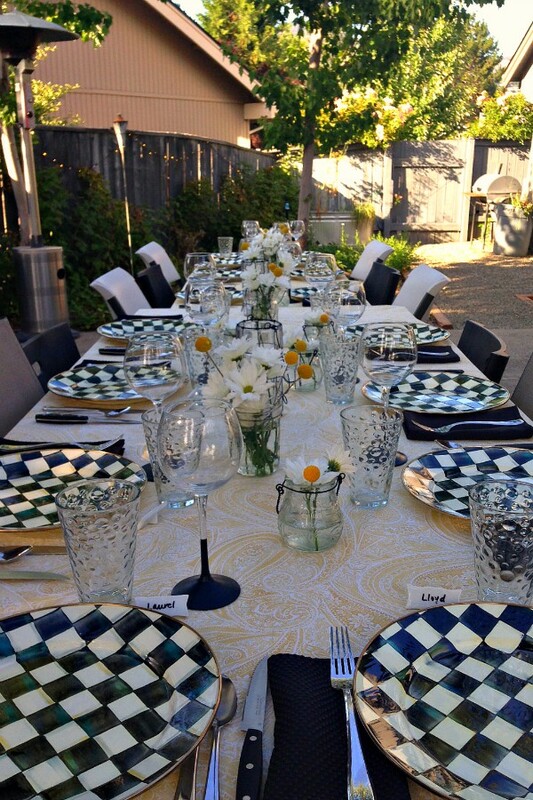 Enjoying an outdoor dinner party is exactly what we did last weekend when our friends came over on a hot summer’s eve. 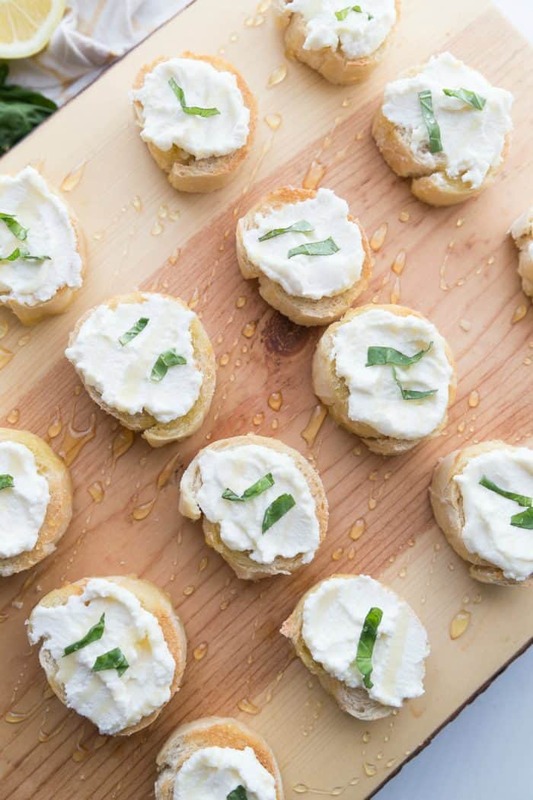 Our good friend, Judy, brought Ricotta Lemon Basil Honey Bruschetta for an appetizer, and it was so fresh and scrumptious! 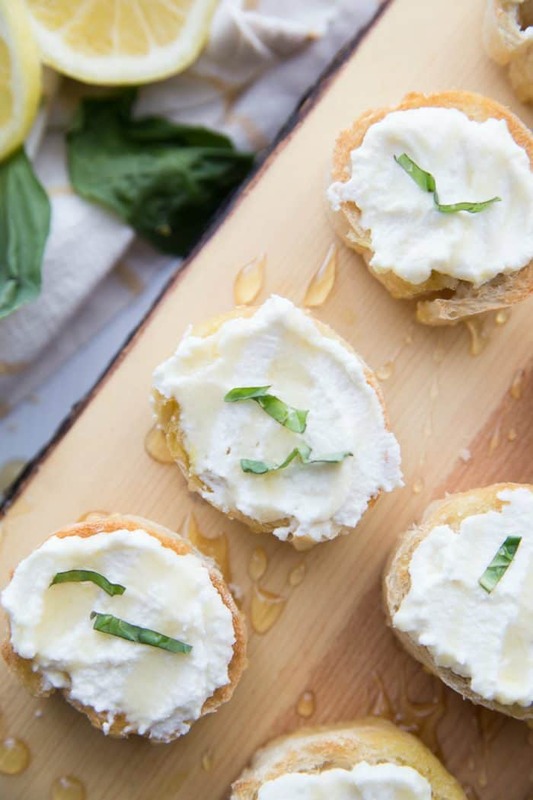 This Ricotta Lemon Basil Honey Bruschetta has now become one of our favorite appetizers to serve, mostly in spring and summer (hello, lemon and fresh basil). Honestly, it’s great throughout the year, too! 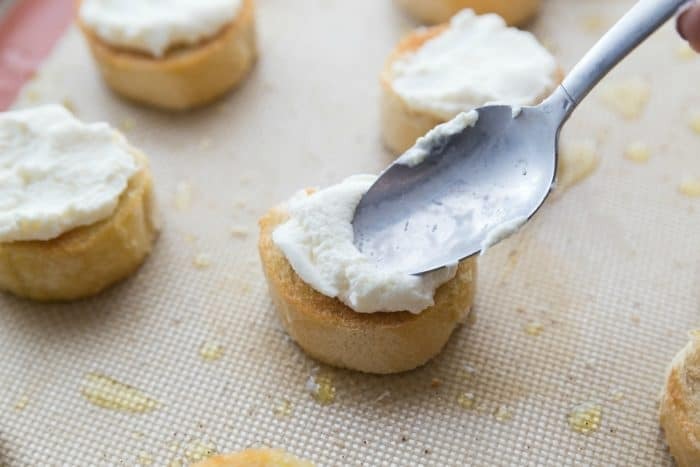 Have you ever tried ricotta on mini toasts or crostini? 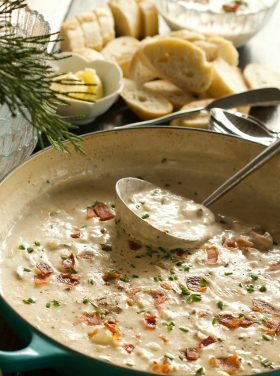 It’s all about what flavors you add into the soft cheese. For a light dessert, you may want to try my Orange Nutella Bruschetta recipe! First of all, what is bruschetta? Typically, to make bruschetta you need 4 basic ingredients: bread, garlic, salt, and olive oil. Bruschetta (pronounced broo-skeh-tah, not broo-shedda) is a toasted Italian bread drenched in a good olive oil, either in small slices (above), or you can cut a loaf of bread in half and toast it that way, too. 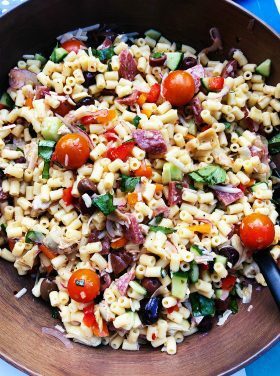 Originally it was served with garlic or tomatoes–pretty basic (and delicious if you’ve ever been to Italy). 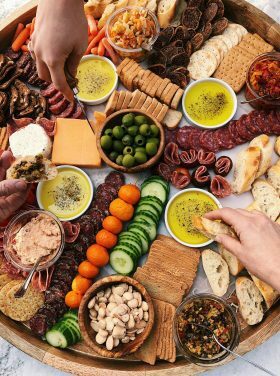 It can also be served with chopped olives, vegetables, beans, cheese or cured meats (think charcuterie). 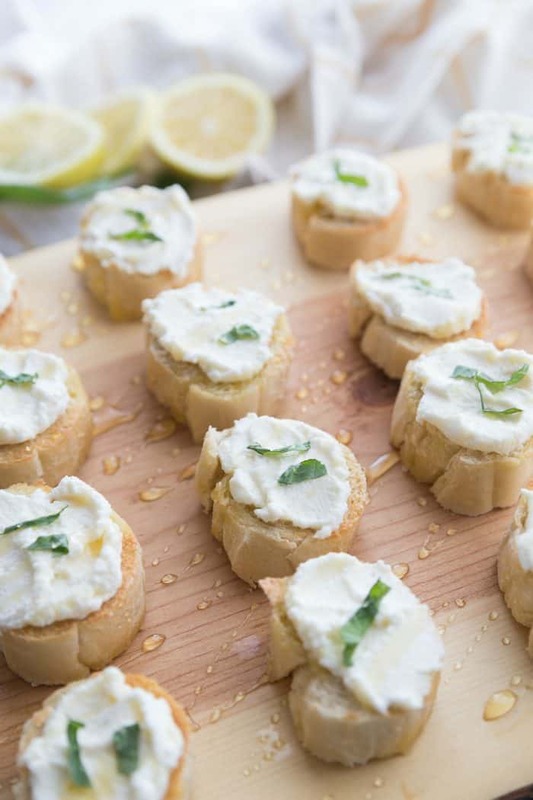 Today we left off the garlic, and fancied up this Ricotta Lemon Basil Honey Bruschetta by adding a premier ricotta cheese, with lemon, honey, and fresh basil! This recipe was inspired by Food52 way to make ricotta and honey, and a recipe by Martha Stewart Living in 2010. Yes, way back then. What makes this recipe so excellent is using quality ingredeints. Look for a premier sweet and creamy ricotta cheese, is what my friend Judy told me. When shopping, if you don’t know, ask someone for help! 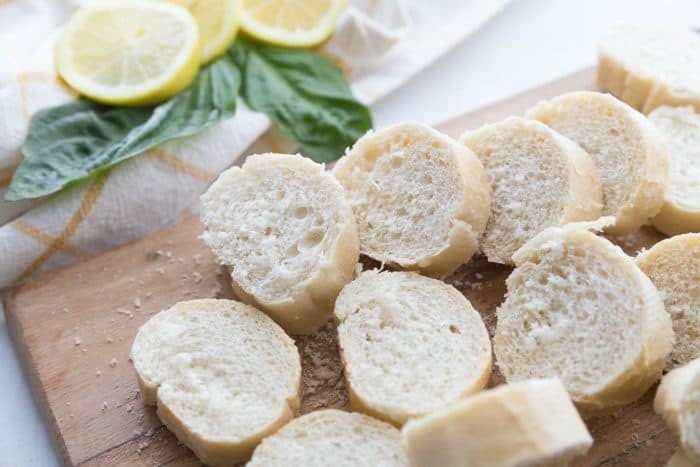 Lemon zest is everything in this recipe … so light and delicate and fresh! On broil, lightly toast one side of the baguette toasts for about a minute. Turn the toasts over, drizzle with olive oil. Toast again until lightly brown. 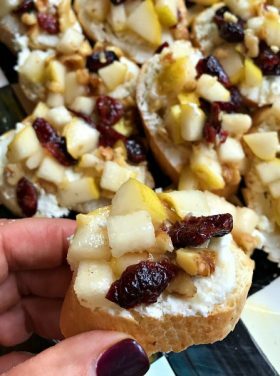 For this recipe, we are leaving out the garlic (the traditional way to make bruschetta), for a sweeter spin on the appetizer! 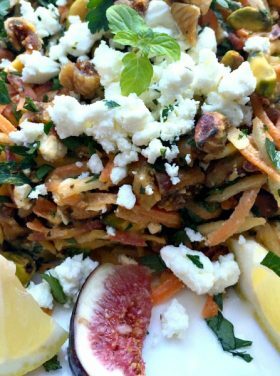 Honey adds a nice touch and doesn’t overpower the basil or ricotta. And then there’s the strips of fresh basil leaves. Be still my heart! We served buffet style inside, and enjoyed our meal at sunset. It was a beautiful night, with a magical summer light peeking through the trees. We sat out under our party lights, everyone contributed a dish, and Paul and I barbecued chicken and steak. The tables were set with daisies and yellow billy balls down the center, on yellow paisley tablecloths. 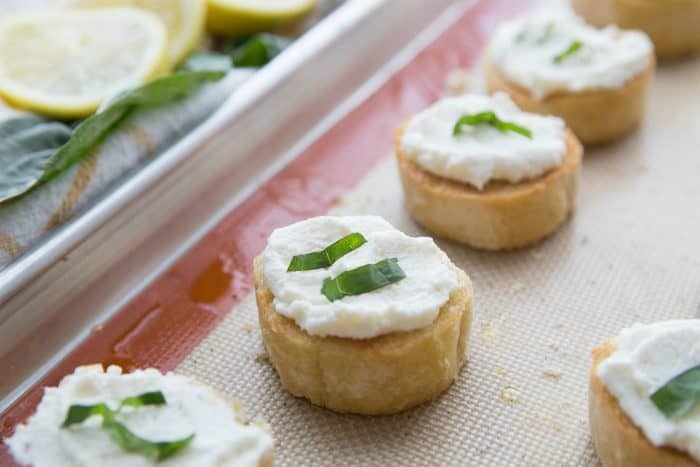 Not just for summer, but any time of year, these Ricotta Lemon Basil Honey Bruschetta bites were a great way to start off our sunset supper! Prheat oven to broil; lightly toast one side of the baguette toasts for about a minute. 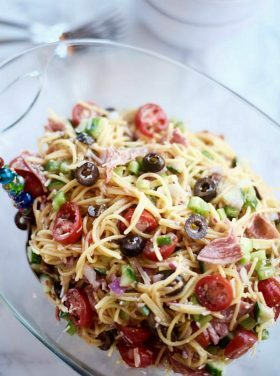 Turn over, drizzle with olive oil. Toast again until lightly brown. 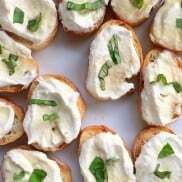 Mix fresh ricotta with lemon zest, and spread onto toasts. Add a few basil leaves; drizzle with honey. Serve! Made this tonight as an appetizer. Delicious! I will make this again. This sounds delicious! 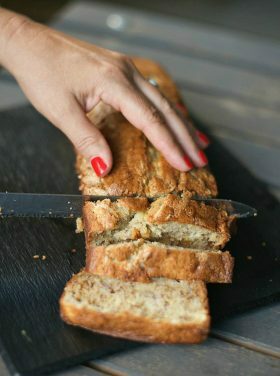 Just wondering if anyone has found the ratios for this recipe? Thanks can’t wait to try it! We made this tonight. It was so delicious ! 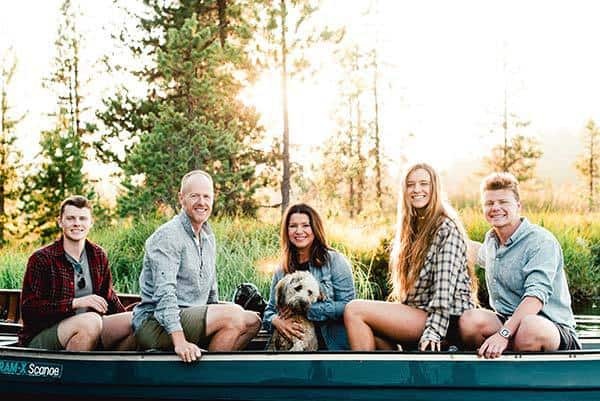 This is a keeper for all of us! It was so easy to make and so lite tasting. I am having a New Years party and will be putting this on the table! Looks like you had a great dinner! Loving that bruschetta, mouth watering for sure! OH YUM! 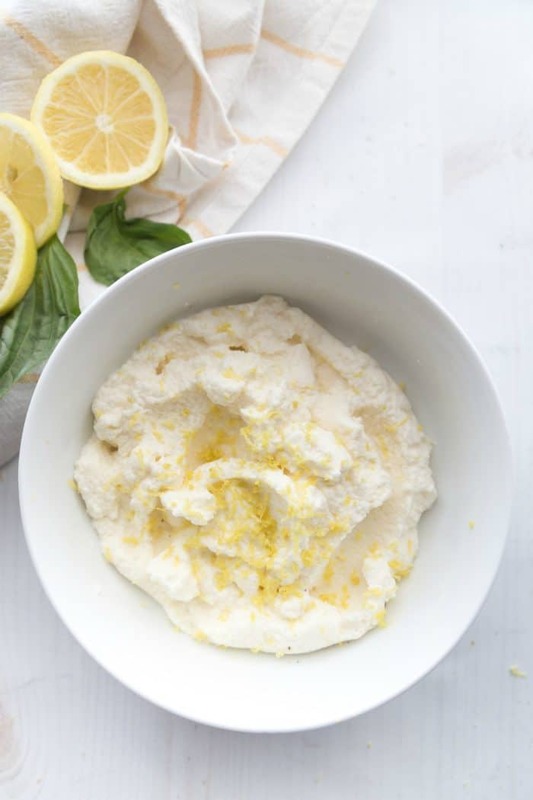 I’ve been looking for an excuse to make homemade ricotta, and I think this is it!